Now normally I am not much of a baker, but I do love my cookies, especially cookies with wild ingredients, like these pine nut cookies. You’ll notice a little bit of rosemary in these cookies, which can seem weird. It itsn’t. The combination of pine nuts and rosemary is a natural: pine and pine, as rosemary’s resiny, piney nature works well with the nuts. And to add to the “wild” feel of these cookies, I add a just a little acorn flour, too. Why? 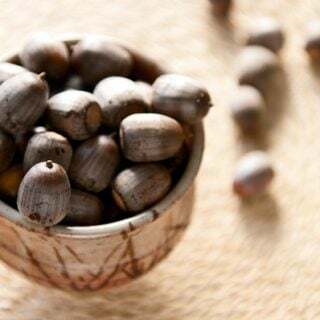 I like the whole-grain flavor you get with the flour, plus its added color and nutrition — and I like the fact that our local pine nuts grow right next to the oak trees I got these acorns from. You can use any other darker flour and it will work just fine. Spelt, chestnut, whole wheat… you get the point. You need to let the dough rest a while if you do use whole grain flours, though, as they need a while to hydrate. Two hours would be minimum, I’d say, and I made one batch of these cookies three days after making the dough and they were fine. These pine nut cookies will be chewy when they come out of the oven, like chocolate chip cookies, but will crisp up as they cool. You can store them a few days at room temperature, but they never last that long here. Most people making this recipe will use store-bought pine nuts, and while it can be difficult to find them, I highly recommend seeking out Italian pine nuts, which are of better quality than the Chinese pine nuts you usually find. If you live in the West, here’s a guide on how to gather your own pine nuts. 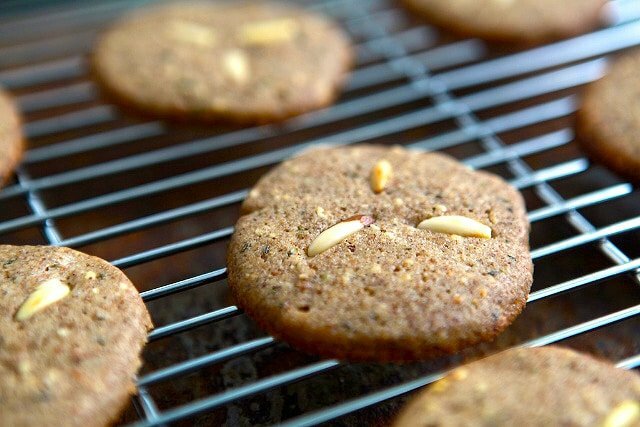 These are simple pine nut cookies you can make with any sort of pine nut -- I use American pinon pine nuts, or sometimes California bull pine nuts. I like a bit of earthy, darker flour in here, like chestnut or acorn flour, but you can skip it or use spelt, whole wheat or something similar. Mix the flours, baking soda and salt together in a large bowl. Preheat your oven to 350F. Buzz the sugar and rosemary together in a food processor until you get rosemary sugar, about 20 to 30 seconds. Pour the mixture into a mixing bowl. Fit your mixer with a paddle attachment. Pulse all but 2 heaping tablespoons of the toasted pine nuts in the food processor until well crushed, but not smooth. The crushed nuts go in the cookie, the whole ones go on top of the cookie. Add the butter to the sugar-rosemary mixture and beat on high speed until it is fluffy, about 90 seconds. Turn off the machine, add the egg, then turn it on low and increase the speed of the mixer until the egg is combined. Add the crushed pine nuts and the flour mixture and beat until this is all combined. Turn the dough out onto a large piece of plastic wrap and form it into a log. The thicker the log, the wider the cookie. One to two inches in diameter is good. Wrap the dough tightly with the plastic wrap and set in the fridge for at least 2 hours, and up to 2 days. You need this resting time for the butter to harden and the flours to absorb moisture. Get two large cookie sheets out and slice the dough log into coins of about 1/4 inch thick. 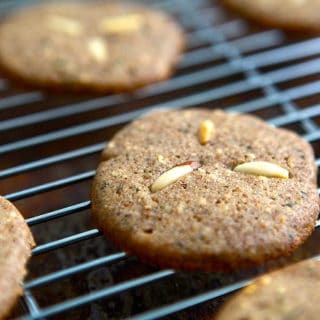 Shape them as best you can into circles (use a cutter if you have one), and press 3 to 4 whole pine nuts into each cookie. Bake the cookies, one sheet at a time, for 12 minutes. Let them cool on the cookie sheet for a few minutes before you move them to a rack to cool thoroughly. They should keep in an airtight container for 3 to 4 days. Note that the prep time does not include the chill time for the dough in the fridge. You can find all sorts of recipes for pine nuts, as well as other wild nuts, right here on Hunter Angler Gardener Cook! My husband foraged acorns and digger pine nuts this year. We have a rosemary bush. Perfect recipe to try!